The problem is, creosote can form when wood is burned incompletely. A smoky fire without enough oxygen emits lots of unburned tar vapors that can condense inside the flue and stick to it, possibly leading to a chimney fire. You can reduce creosote buildup in your fireplace by providing adequate combustion air, which will encourage a hot, clean-burning fire. To check for creosote yourself, first make sure there’s no downdraft from the chimney. If you feel an airflow, open a door or window on the same floor as the fireplace until the downdraft stops or reverses and air flows up (tape tissue to the fireplace opening and watch its movement). Then, while wearing goggles and a basic disposable dust mask, take a strong flashlight and your fireplace poker and scratch the black surface above the damper (smoke chamber). If the groove you scratch in the creosote is paper thin, no cleaning is needed. If it’s 1/8 in. thick, schedule a cleaning soon. If you have 1/4 in. of creosote, do not use the fireplace again until it is cleaned—a chimney fire could occur at any time. The easiest creosote to remove is the feather-light dull gray, brown or black soot. The next form is a black granular accumulation, removed fairly easily with a stiff chimney brush. The third type of creosote is a road tar–like coating that is much harder to remove even with stiff chimney brushes, scrapers or power rotary whips. The final (and most deadly) is a shiny, glaze-like coating on the flue that is virtually impossible to remove. You could try to remove creosote yourself, but for a thorough job, call a certified chimney sweep. Make sure the sweep you hire ($150 to $200) does more than push a brush. A chimney sweep needs to be knowledgeable about building codes, trained to recognize deterioration or venting problems and able to advise you regarding the chimney’s condition. 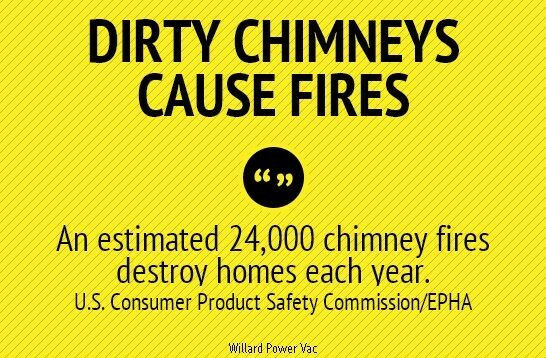 And the National Fire Protection Association recommends that chimneys, fireplaces and vents be inspected at least once per year. Save money and avoid a long wait by having your chimney inspected and cleaned in the spring.